Today began with a lesson with Arvanitis. We continued to work on the fourth mode called "Legetos." I learned more about rhythm and integrating the textual accents into the rhythm, as well as certain ornaments and other oral traditions about how to perform certain melodic cadences and phrases. On my way back from the lesson, Panagiotis called me and wondered if I was free for lunch. I met Panagiotis providentially in a bookstore a couple weeks ago. 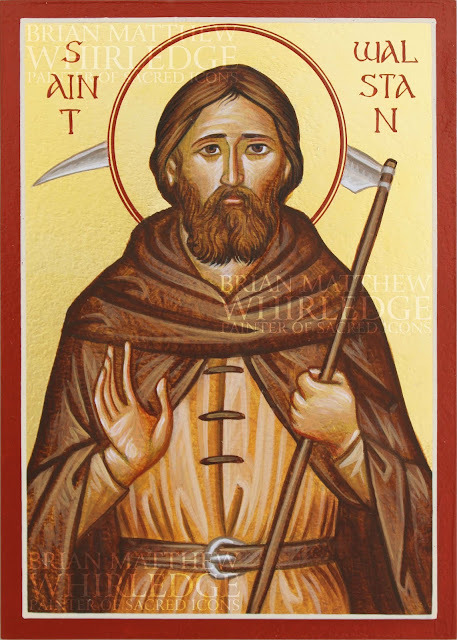 He has made arrangements for Adrian and I to visit Mount Athos next week. I stopped by a bookstore an looked at a couple of coffee table books about Naxos, which I will probably buy tomorrow, because I had to run to meet Panagiotis. "Do you like calamari?" he asked. What kind of question is that? 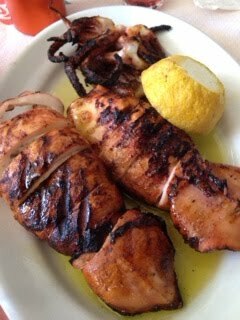 "I know a taverna in Pireaus that makes the best grilled calamari." I got on his moped (I said I wouldn't do it again...oh well) and we were on our way. 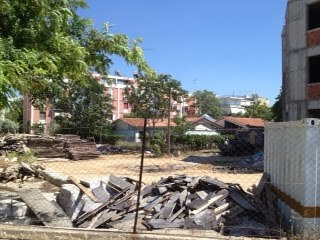 Today was even more scary than the city center, because we took the highway to Piraeus. "Did you see any cops?" he asked. "No," I answered. "Exactly. In America, they're everywhere. Here, they don't do anything. People drive however they want." I couldn't describe the traffic better if I tried. We arrived unscathed at the taverna. The place was packed. 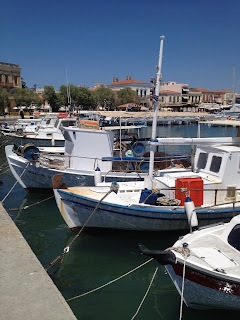 You can't tell that the country has hard times by looking at a taverna...they are always full. Soon, the first course arrived. It was a kind of spread for the bread. 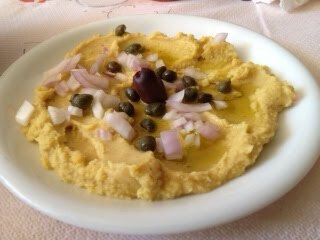 It was not exactly hummus, but similar, topped with onions, capers, and olive oil. 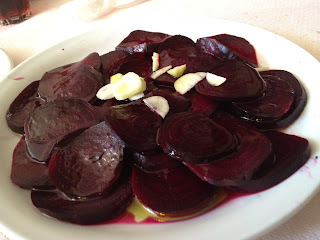 Next came beets, doused with olive oil and topped with sliced raw garlic. The calamari arrived. Two beautiful specimens, each about a foot long, and grilled to perfection. They were whole: tentacles, body, and fins. Simply the best. We were stuffed. The total bill? 14 euros, including wine and coke. We discussed life in America and Greece. Panagiotis lived in Chicago for a number of years and still owns a house in Joliet. He grew up not far from here (we'll visit it in a minute) on a farm. I told him my father is a farmer; he wants to visit the next time he's in Chicago. He asked if I live near any Amish; the answer is, of course, yes. I told him about my admiration of how they are about the only Americans who have preserved some sense of community. We drove past the house where he grew up, which used to be a four acre farm. The government bought it and built projects. We continued to his house. It is his "hesychia," (silence) as he calls it. It is a little sanctuary in the city. A tiny door on the street opens up to a narrow alley. 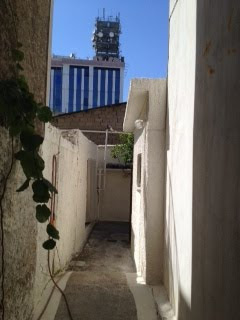 A courtyard, complete with a lemon tree, emerges at the end of the alley. Every room is around the open courtyard. 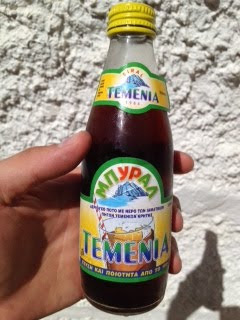 First we went to the kitchen, where he gave me a Greek soft drink, which was very good, and not unlike Cream Soda, but still a little different. 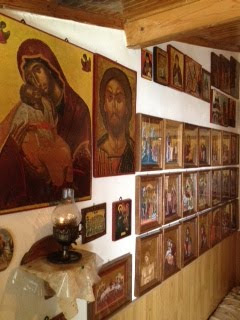 The first thing that struck me was that the walls and bookshelves were full of icons. 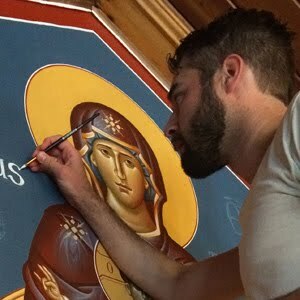 He explained that the Geronda (elder) from Mount Athos brings these icons (the handiwork of the monks) to sell in Athens. 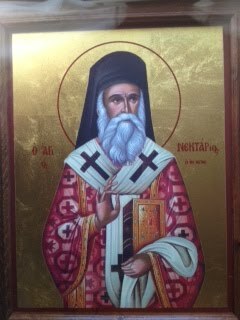 He gave me a beautiful icon of St. Nektarios that we will bless on his relics on Friday. 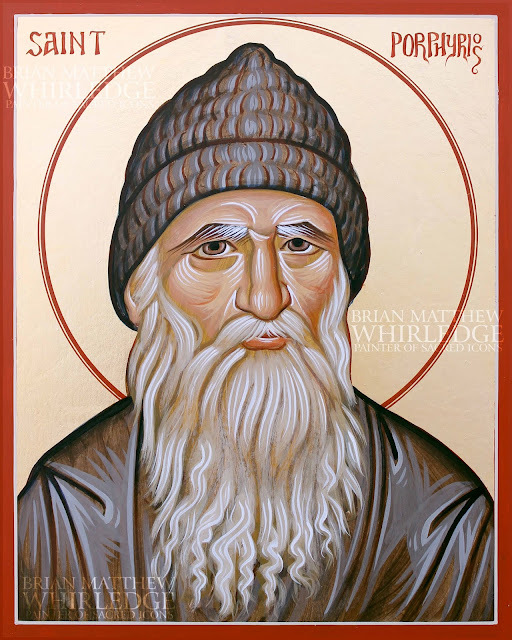 The icon is printed with a special process that looks remarkably like it is handpainted, and has 14k gold leaf. Panagiotis told me about his love for dictionaries (especially good ones, because bad ones spell words differently). 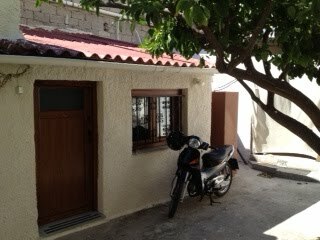 I talked about Naxos; he would like to visit (especially when I told him that my room cost e20). He showed me around the other rooms of his house (passing through the courtyard from one room to another). He is in the middle of renovations. He showed me the new kitchen, office, and bedroom. "And this will be a guest room... you can stay here next time you come to Athens." I know deep within that this is not my only trip to Greece...this beautiful land will draw me back. The last room he showed me was a real surprise. 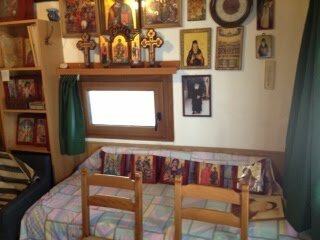 He literally has a skete (small monastery) in his house. The walls were covered in icons to that point that it was hard to tell what color the paint was. There is a lamp which is lit 24 hours a day. There were two beds, neatly made. One had an iconic photograph on the pillow. "This was the cell of the Geronda Chrysostomos. People come here to pray to him." The other bed belongs to the Geronda from Athos. He stays here when he comes to Athens. Panagiotis drove me to my apartment (the route involved first crossing traffic on the highway, then going over the curb and across the median). Now, I appreciate American traffic laws and enforcement. After returning to my apartment, I walked down to church supply row. I was warned about Greek store hours. On Monday, everything was closed. Yesterday, every store was open until 8pm (and later). Today, everything had closed at 3. Oh well. As I was heading back, I happened upon a store that reminded me of the flea market. 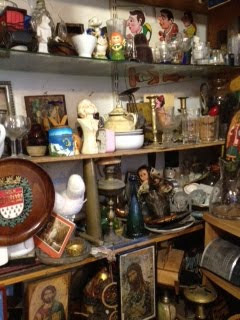 Maybe "Hoarders" is a more descriptive term. 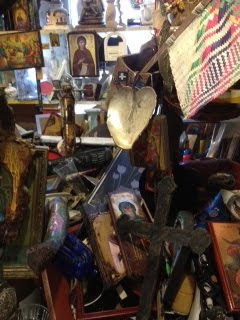 The store was navigated via a narrow walkway (some places too narrow) with old Greek stuff literally piled up (and hanging from) the ceiling. I don't mean touristy kitsch. I mean old icons (many handpainted), shadow puppets, lamps, censers, pipes, coffee pots, and a host of other unidentifiable wares. As I ventured further into the store, I realized I was utterly alone. "Γειά σας." I said, to no reply. Hmm... "Am I supposed to be here?" I wondered. Eventually the elderly shopkeeper showed up (he was sipping coffee in the shade across the street). I found an icon I liked, a sterling silver dish, and a lamp. Stavros, the shopkeeper, and I bartered over prices. In the process, I discovered that he will have to close his shop soon (I couldn't quite gather if it was because of higher taxes, owed taxes, poor economy or all of the above). I made a bold proposal: "How much if I bought all the lamps." "Δέκα." Ten each. Wow. Now that's a steal. The cheapest ones here are 35 euros (in the US, you can't find them for less than $50). The next half hour was spent discovering lamps, reaching, crawling, and stretching, untangling, and gathering. 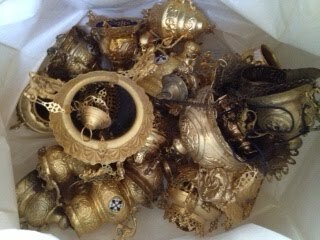 Now, I am bringing back a hoard of lamps. Some are very old, some are less old. Most need to be polished, some need a glass, some need a new chain, others need a little work. All are beautiful.